Over the past month we had our first friends come to visit since May. Anastasia came for 4 days at the end of August and our good friends Frank and Dian came for almost 2 weeks beginning the 13th of September. It was really great to have them, and we had a truly wonderful time. 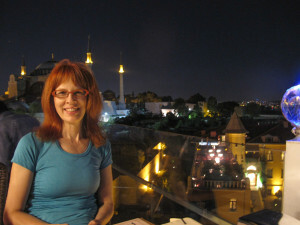 Anastasia’s arrival coincided with our son Michael’s departure from Istanbul so we rented a car and and had a fun 5 hour road trip to Istanbul. We had left Purrr at a marina in the (much smaller) town of Ayvalik (https://en.wikipedia.org/wiki/Ayval%C4%B1k), located just east of the Greek Island of Lesbos. Ayvalik is the most northerly port we would visit this year. From here on we will drift south along the Turkish coast until the end of October when we will leave Turkey and head back to Greece. We have reserved space for 4months at the marina in Agios Nikolaos (http://www.cretetravel.com/guide/agios-nikolaos/) on the Island of Crete where we intend to spend the winter. 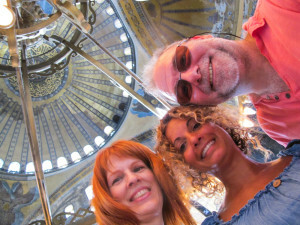 Before we left Istanbul, thanks to Anastasia’s great pre-planning (although Sue is getting better, we usually just tend to wander aimlessly wherever we go… Be sure to remember this when you come to visit! If you don’t plan where you want to go and what you want to see, we’ll likely just float along aimlessly!! :), we spent a great day with Anastasia and got to see many of the main sights, including the Blue Mosque, Topkapi Palace, Aya Sofya and the Grand Bazzar. Istanbul, formerly Constantinople, is truly one of the world’s most amazing cities. Part in Europe and part in Asia, its people are very friendly, helpful and welcoming, and the sights sounds and smells are spectacular. Although you certainly need to be aware of petty crime like pick pockets, at no time did we ever feel threatened in any way, and that is saying a lot – seeing how the condo we rented was in probably one of the seediest parts of town (the stairs to our apartment was actually the birthing ward for the local stray cats and our doorperson a different lady of the night each night (I told you we don’t do a lot of fore-planning!!). 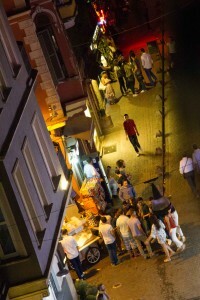 The 1.4 km long pedestrian street, İstiklal Caddesi (along which there is an “entertainment district”, which our condo was in the very middle of, and which parties very loudly until 5am every night except the night Anastasia arrived), receives more than 3 million people during a single day on weekends (more than the entire population of Toronto! ), and we can attest to it! After a few days walking around a bustling city in the heat of summer, we were more than ready to head back to the relative comfort of life on the water (although still hot!). 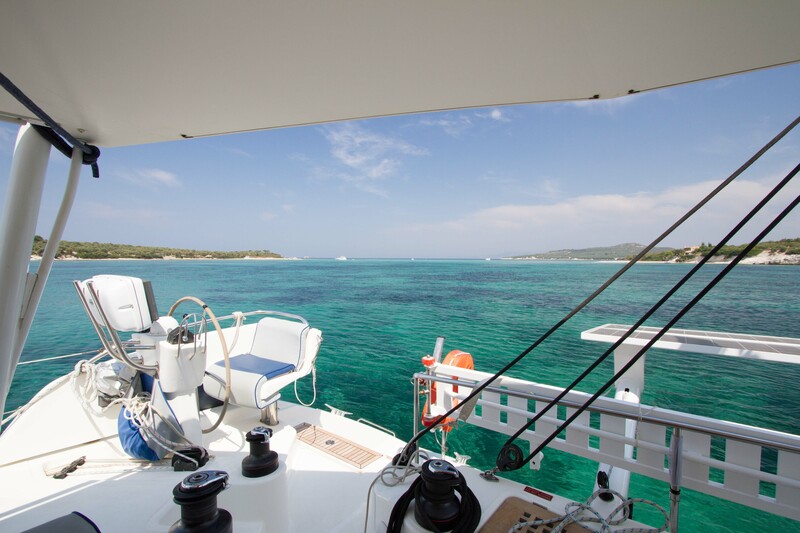 Our loose plan with Anastasia was to spend a couple of nights at anchor along the way to another small town called Foca (https://en.wikipedia.org/wiki/Fo%C3%A7a), about 50 miles to the south, the now infamous town where our outboard was liberated from our dinghy and put to some other apparently more important use! (See my next post for a blow by blow of that fiasco!). We found a wonderful anchorage between two Strange Islands…. really, that’s what they are called; Garip Adalari “Strange Islands” (https://en.wikipedia.org/wiki/Garip_Island) (N39⁰ 00.341’ E26⁰ 47.381’), where we stayed for two nights before heading on to Foca. The anchorage was as close to perfect as it gets. Crystal clear water, almost deserted, well protected from the Meltemi and almost everything else. It was a great day and couple of nights. On both days heading to and from the Strange Islands we had fabulous winds (15 to 25 knots) and great sails. After Arriving in Foca, a smallish fishing village turned touristy, we walked around the old town and had a wonderful dinner under a canopy of grape vines. The next day we saw Anastasia off in a taxi to the Izmir airport where she was continuing her planned vacation in Italy. We loved Anastasia’s company and hope she will come back to visit us again real soon – but next time, we hope she stays much longer!! !